I can’t believe it has taken me this long to blog about one of my top favorite restaurants in Royal Oak – Inn Season. I was skeptical about how a strictly vegetarian restaurant could be so darn satisfying, but every time I go, I am in foodie heaven. Between their stir fries, Mexican fare, salads, and burgers, this place has a little bit of everything. Now, I’ve only heard a few people complain that they missed the meat, or who walked away still feeling hungry. Trust me, people – Inn Season is not all about veggies ONLY. They do real cheese, vegan cheese, dressing, and even BUTTER. There is creativity, warmth, and flavor in every dish that I have tried. 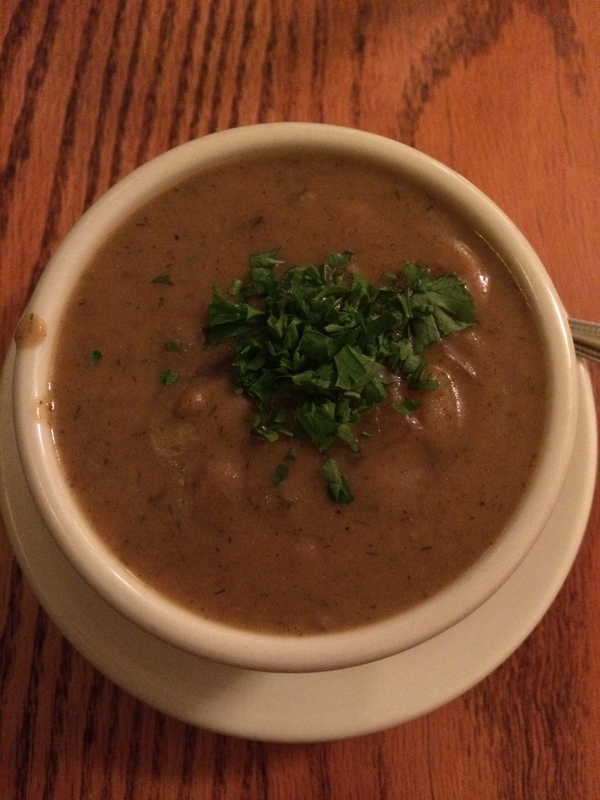 My go-to starter is the Budapest Mushroom Soup. If you had to do a blindfolded taste test, I doubt you’d assume it’s strictly veg. The broth is thick and hearty, and is almost creamy in consistency. Dunk a piece of their fresh bread in your bowl, and you’ll feel instantly warm and fuzzy inside. While Inn Season has frequently changing specials (I’ve tried a couple), I tend to veer towards their stir fries. They come in a HUGE bowl and are easily shareable. The peanut sauce that comes with the Szechuan stir fry is absolutely to die for, and inspired me in one of my previous posts, Perfect Peanut Stir Fry. I recently branched out and tried their Fourth Street Burger, which is a house-made patty with lentils, oats, brown rice, millet, cracked wheat, cornmeal, and sesame seeds…holy cow! I love ordering veggie burgers like this because the chances of me making them at home are slim to none. I got mine topped with cheese for an added bonus. 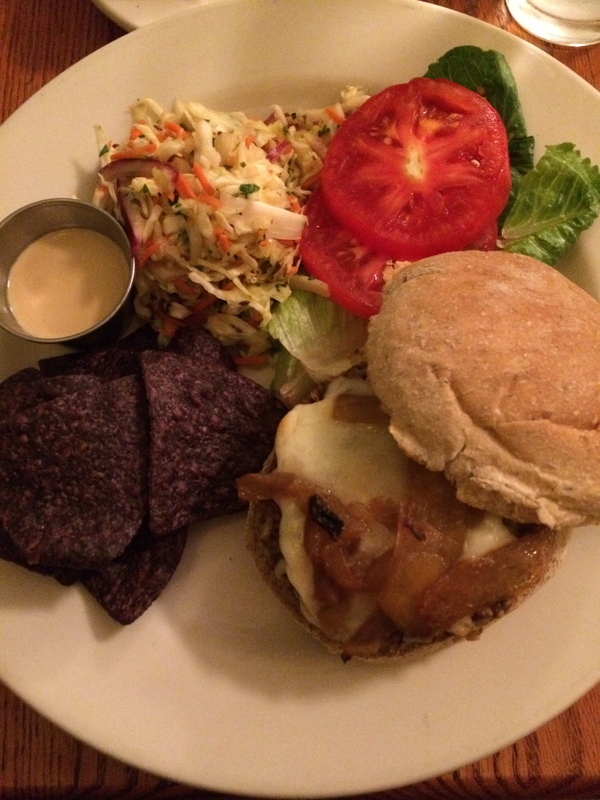 All of the burgers come with lettuce, tomato, sautéed onions, and a side of coleslaw, blue corn chips, and a sauce of your choice. Their Mexican apps and entrees are also good options, and I have yet to try one of their pizzas. I have never had an issue with the service, quality, or price. And if you’re concerned about not having meat on your plate, tell yourself that the bacon can wait ’till tomorrow. Chances are, you probably won’t even think about it. Hours: CLOSED Monday, T.-Th. 11:30 a.m. – 9:00 p.m., Fri.-Sat. 11:30 a.m. – 9:30 p.m., Sun. 11:00 a.m. – 3 p.m.
View the menu here and check out their website: http://www.theinnseasoncafe.com/ for more info! Please comment and share your top picks if you’ve been to Inn Season, or ask me a question if you’re considering a visit! *Inn Season is certified Kosher by Kosher Michigan. Check them out at http://www.koshermichigan.com.